Aside from his technological and scientific accomplishments, he was a statesman and helped to lead the movement for United States independence. Franklin was born on September 17, 1706, in Boston, Massachusetts, the fifteenth of 17 children. At age 10, after only two years of formal education, he entered his father’s tallow and candle making business, and three years later he became an apprentice at his brother’s printing shop. As a teenager he read extensively and published many essays under a pseudonym. In the 1740s Franklin devised improved methods of street paving and lighting and helped establish the institution that later became the University of Pennsylvania. He constructed a stove in 1744 with greater fuel efficiency and heating capability than open fires; it also dramatically reduced the number of deaths from burning, a major occupational hazard for women who did most of the cooking in Colonial times. 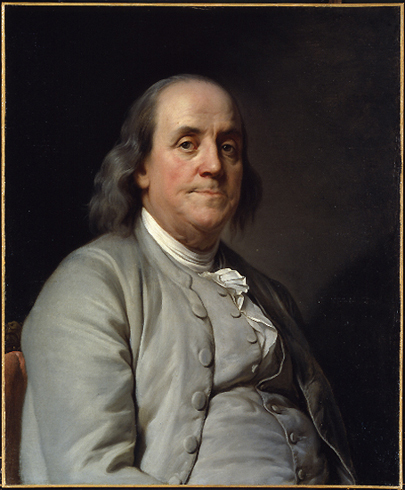 In 1747 Franklin began his experiments with electricity. He theorized that an “electrical fluid” flows between materials, such as water and metal, and that an electrical charge builds between a collection and an absence of electrical fluid. To prove that lightning is caused by electricity, he devised his famous 1752 experiment: in a thunderstorm he flew a kite with a metal key at the end of the string and received an electrical shock. He concluded that thunderclouds collect electrical fluid, and that lightning represents a discharge of electricity between the cloud and the ground. He invented the lightning conductor, reasoning that a metal rod (connected by wire to the ground) would attract and direct the electrical discharge and thus prevent bolts of lightning from harming people or property. In 1784 Franklin invented bifocal lenses, so he could read and look up without removing his glasses. Bifocals have since solved the vision difficulties of millions of people. The second half of Franklin’s life was devoted to politics. He played a leading role in events leading to the independence of the United States and was a member of the committee, along with John Adams and Thomas Jefferson, assigned to draft the Declaration of Independence, which was signed in 1776. Franklin was also involved in the development of the Constitution and the support he lent to it helped in its ratification. He developed an international reputation as a skilled diplomat by the time he died, on April 17, 1790, in Philadelphia. Franklin’s various achievements made him one of the most revered men in the United States and one of the most respected Americans in the world. His scientific legacy includes his civic improvements, his invention of the Franklin stove, and his contributions to the understanding of electricity. Franklin’s improved pavement and lighting methods for Philadelphia streets decreased accident rates and increased the safety and aesthetic appeal of the city. His introduction of a free library, fire department, and police force provided models for other cities. The Franklin stove, as his invention came to be known, had a major impact on people’s everyday lives. The stoves efficiency decreased the cost of heating and cooking, and its capacity to produce great amounts of heat made the frigid winters of the Northeast more tolerable. Improved versions of the Franklin stove were soon used across the country and are still manufacture today. Franklin was instrumental in advancing the understanding of electricity, one of the most significant elements of the scientific and Industrial Revolutions and of modern technological progress. Others in both Europe and the American colonies had begun to experiment with electricity in the eighteenth century, but Franklin was the first to formulate a theory that explained nearly all observed electrical phenomena. Electrical research advanced rapidly, and electricity has become an integral part of the modern world, providing innumerable conveniences.